I think the First Lady trumped the Queen during this visit. I disagree. I don't think this was some fashion contest. Both ladies looked equally lovely at each of their appearances. The two ladies wore the same style of dress and handbag. i wonder if it was planned? I think so too and that is wonderful, isn't it! Lovely looks on them both. 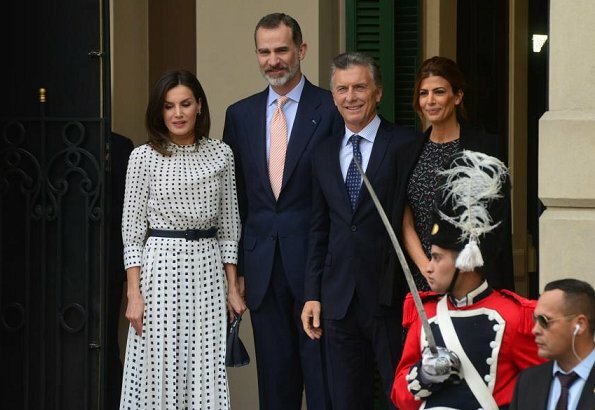 ¿Letizia era una modelo de pasarela? ¿Cuándo? Es periodista. Yo creo que deberías volver a tomarte la medicación, corazón. Teresa2424, Letizia has never been a model, she was a well known journalist before she married Felipe, where do you get your information? You seem quick to spread fake facts . SMH!! It seems that the wardrobe was planned by the two ladies. Today's yin and yang designs cannot be coincidence. 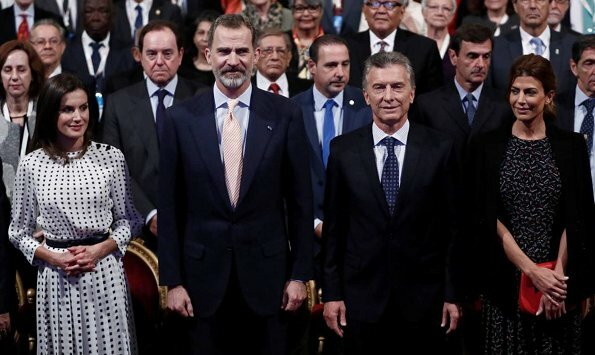 In addition Mr. Macri's tie also ties in (bad pun) with the queen's dress. Both men wear navy. For the rest of the outfits, they alternated necklines and found ways to promote Spanish and Argentine brands. Their styling is modern and chic. @ 11:51. It is such a great compliment to recognize Letizia's choices as catwalk worthy. Most fashion is an adaptation of original runway pieces,...and the famous models usually command million euro salaries(she is famous). 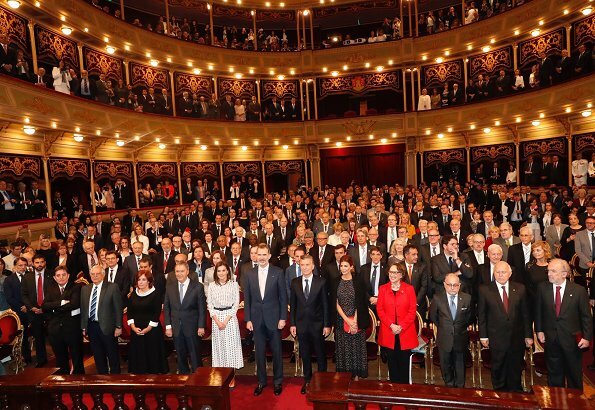 Bravo Letizia! ..if that was not the intent,...Women have struggled mightily to be elevated from barefoot and pregnant to showing that they are on an equal footing with men when given the opportunity, but some are determined to throw it all away by dragging each other down. 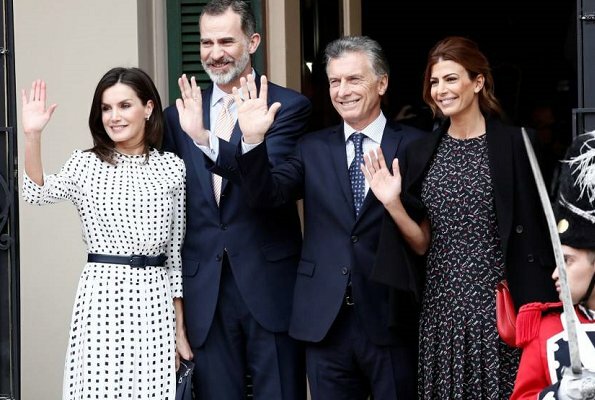 Señoras, no la comprendéis :)) Lo que quiere decir es que Awada es un compendio de virtudes: "sencillez, fineza (finura, en realidad) y calidez" y Letizia sólo es un maniquí... Y aún así es superada por la argentina como dice el Unknown 8:48 hahaha. Except for the woman in red, the queen is the only spot if light. I think both ladies are impeccably dressed and wear their clothes very well. They are both beautiful ladies and each have their own unique style. 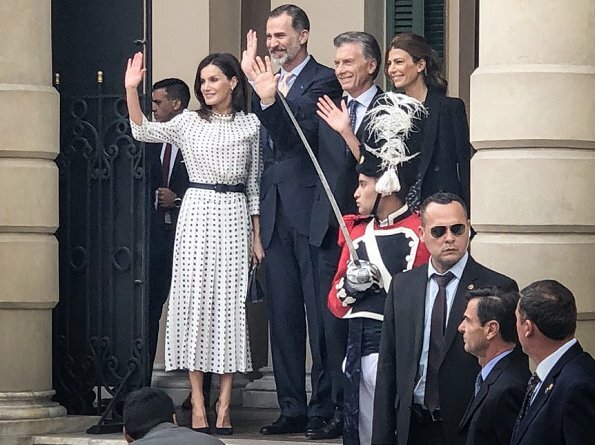 I have noticed that Queen Letizia often poses for the camera which comes of unnatural and stiff, where first lady Juliana Awada who is very alluring and exotic (she resembles Sofia Vargas) stands there effortlessly. In my humble opinion the queen makes love to the camera where as the camera makes love to the first lady! 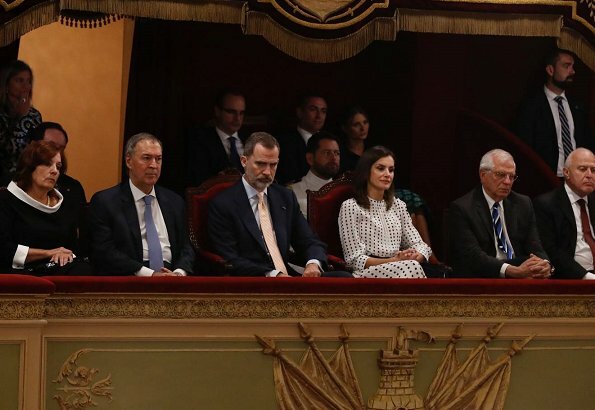 Tienes razón ChB, Letizia ha hecho como QEII, asegurándose de que en todo momento se sabe quién es y dónde está la Reina. Es un vestido repetido, pero bonito, fluido y muy cómodo para viajar después. Los accesorios azul marino son muy acertados. Great look for the Queen and the First Lady. 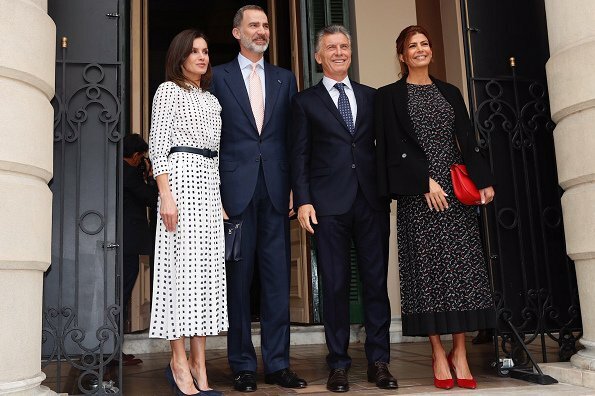 For the men's fashion, Mr. Macri was flawless. Always color coordinated with ties quietly complementing his suits. The king's pink shirt at dinner and the loud tie that matched nothing on the last day..not for a state visit. 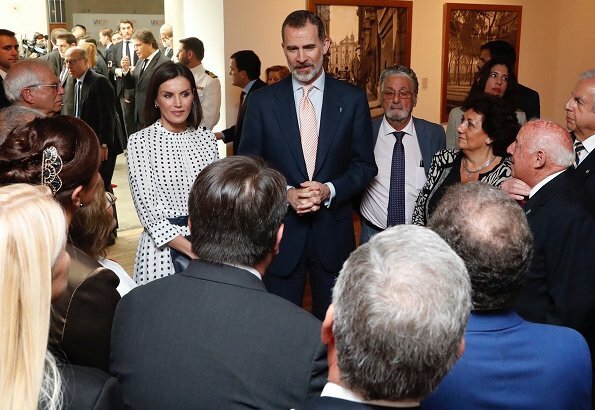 And you dare to teach King Felipe, Kings' son and grown up in the Monarchy and protocol, what is for a state visit and what not.. I got the giggles, sorry. Felipe has not got any valet, he was even living alone before marriage in his own house. That's in other countries. He coordinates perfect in a modern way...not a holdover at all. 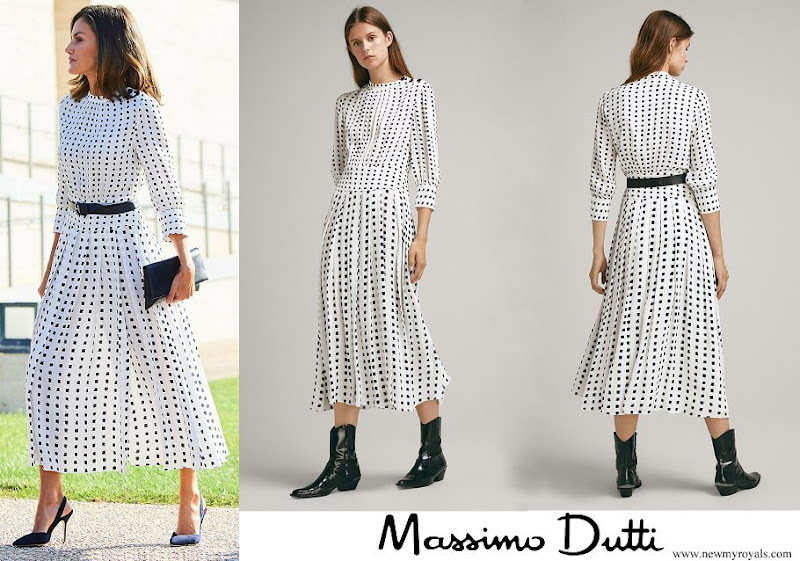 Maybe you are the old fashioned who likes the marchy matchy too much,which is not on trend anymore. Jeje, lo que es hablar sin tener ni idea. 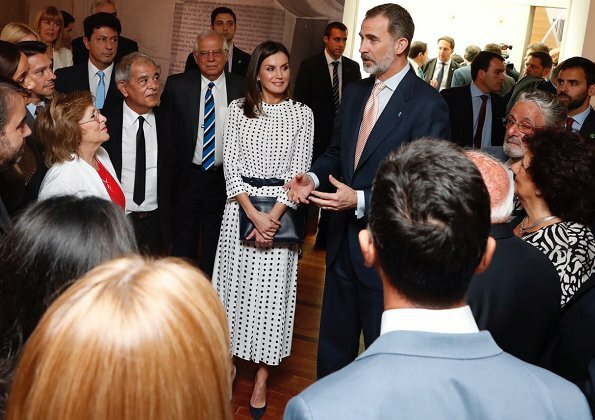 Felipe VI es uno de los caballeros más elegantes del mundo desde hace años. Si algo distingue a un auténtico Gentleman es la confianza en sí mismo y permitirse pequeñas "diableries" en su atuendo porque no tienen nada que demostrar. Así lo hace el Prince of Wales y antes Henri de Montpezat, esposo de Margrethe. Ceñirse drásticamente al "coordinado" de pies a cabeza denota inseguridad. Sal a que te dé el aire. 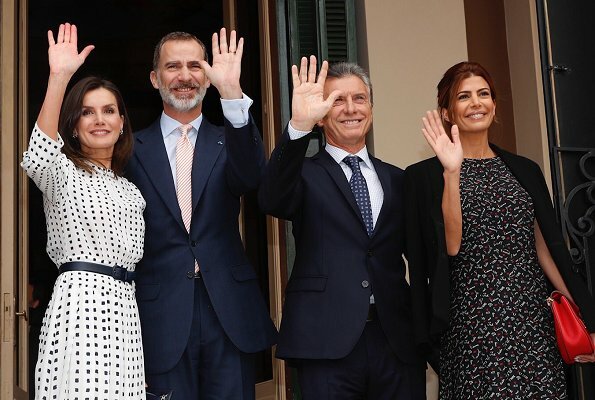 No sé qué haces aquí entre tantos medievales. Anonymous @ 12:17' can you enlighten me about what is the color shirt/tie/ pants/ jacket that he should've worn? I can't find anything wrong with his attire, but of course we all have different taste in clothing, what I don't get is why you throw imaginary rules, just because you write something doesn't make it true. I am giggling with Anon@ 11:05 , protocol indeed? 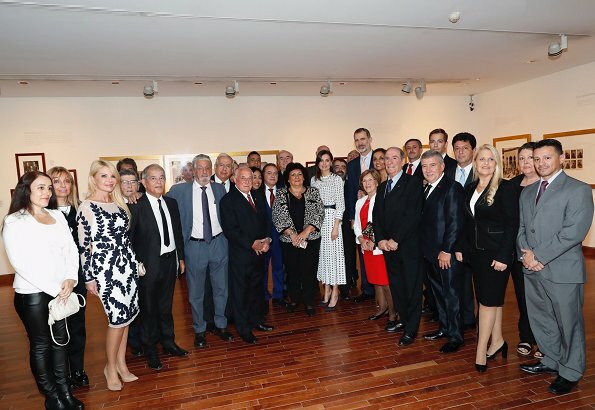 Please, let us take emotion out of this and use the same criteria that we used for Letizia's clothes. The shirt and tie were the original topic, not his suits. Just as we can think of other occasions where her clothes would work better, the same can apply to the king. You can see the theme at some events. With the gold tie, the queen wore the gold bee. Simple things that enhance pictures to be seen around the world. For this post, picture #6 tells a story. As for the valet, to be sure he does not spend his weekends polishing his own shoes, matching socks into pairs when they come out of the clothes dryer, or lining up the suits in order of events. Again, originally no mention was made of protocol, his person, his parentage, nada. Add to the list Henri of Lux. Blue shirt , navy suit and pink tie, my husband is wearing the same today for a wedding. It must be in your country where it is odd. Here is the most used.